My Life in Second Life: Exhibition Opens! The glint of eye, the crook of an elbow, the curl of the lips; what is it about these little parts all strung together that reveal a personality? Historically, portraits represented the authority, lineage or religiosity of a person. Within SL, a portrait is an articulation of identity in a realm where identity is more fluid than many of us are used to. 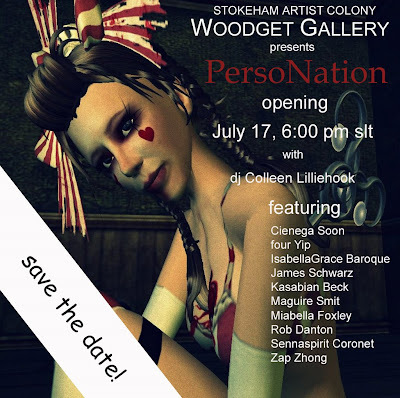 PersoNation presents the genre of portrait making with the works of ten sl artists. Some of the creators are artists in rl, some do not consider themselves artists at all. Some manipulate their images using a variety of tools, or deliberately pose their subjects, while other images were captured quickly. Each portrait expresses the unique intersection of artist and subject. PersoNation asks you, the viewer, to connect with each and discover your own story. Come hang out on Friday night for dancing, contemplation, conversation and relaxation! The Woodget Gallery: teleport from here.